Berlin's Admiralspalast Theatre. 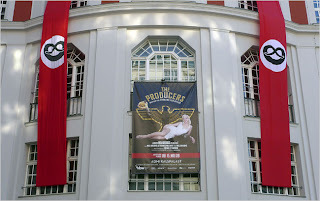 Site of the German stage premiere of Mel Brooks' The Producers. Be funny to be strolling down the street in Berlin in 2009 and suddenly see that. But yes, let us indeed note that those are pretzels. The Times' man in Berlin, art critic Michael Kimmelman gives the rundown on how the show's playing there. As to the inevitable question asked "Can the Germans laugh at Hitler?" --seems to me they've been doing that for a long time already. Arturo Ui, anyone?